Then she made...: It's Cookie Sheet Calendar time! It's Cookie Sheet Calendar time! You've been very patiently waiting for this tutorial and I'm happy to say, it's finally time! 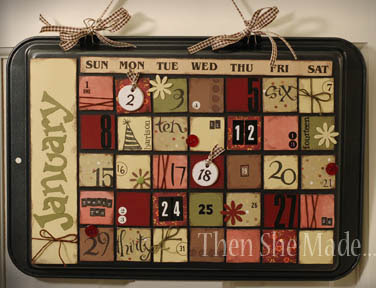 These calendars are not hard to make but because there are a lot of pieces to cut and decorate they do take some time. I'm going to break the steps down into 4 tutorials which I will share in order over the next couple of days. This will make the process much more manageable for you and for me! Plus, if you want to make one as we go, this will give you time to complete each step. 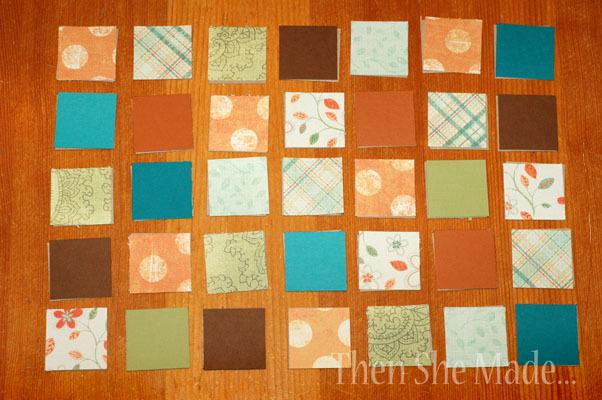 Step 1: Start by cutting 11 or so squares out of regular paper. You are trying to determine if the size of the squares will fill the space. 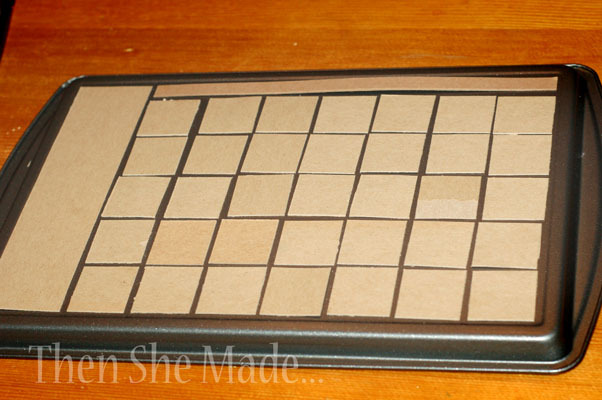 Lay them out on the back of your cookie sheet (like below) and determine if they look like the right size. You need to leave a small space at the top for the days of the week strip and a space to the left for the months. The squares I will be using for this calendar ended up being 1.1/2 x 1.1/2 inches. NOTE: If you are using a different size of cookie sheet you will need to determine the correct measurements. For the calendar shown below I changed the orientation and made it vertical instead of horizontal and ended up using rectangles instead of squares. 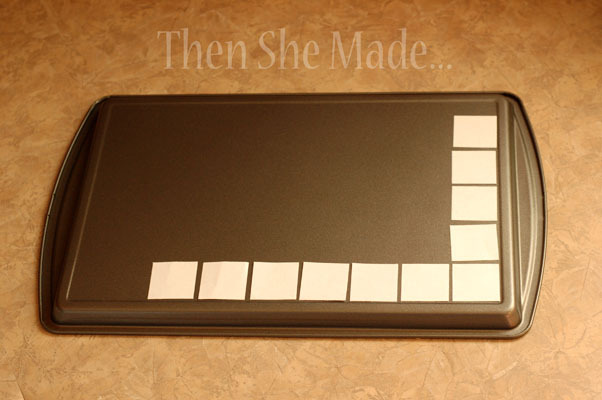 To determine the size of those rectangles, I followed this process. cutting a few rectangles, laying them out, and then adjusting, re-cutting, etc... until I got the right size. Be sure to use regular paper for this step. 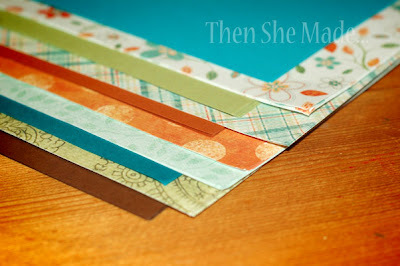 That way you can save your decorative papers for when you know the right size to cut. Step 2: Once you know the measurements of the number squares, you need to cut 50 of them. 35 will go on the front for the number grid and 15 will be on the back that will be swapped out for holidays. NOTE: I decided that I wanted my pieces to be pretty firm so I am putting chipboard on the back of all of my pieces. This does mean extra work for me but it's worth it. If you have really thick papers you are probably fine to just use the papers. However, if you are using thin papers or have kids at home that will be using your calendar, I highly suggest using chipboard too. And, not to worry, if you don't have chipboard, just cut up a cereal box or something like that. 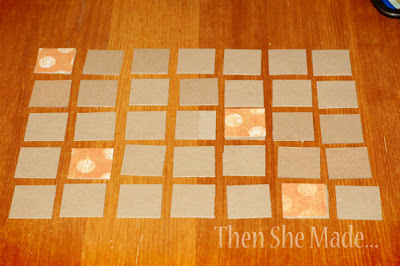 Step 3: Next you need to cut the other chipboard pieces that will be part of your calendar. The days of the week strip should be cut to: 11-1/2 inch x 1/2 inch, you need only one. Once you have all your pieces cut, lay them out on the back of your cookie sheet and make sure they create the grid and will fit properly. You should have something like what is shown below when you are done. 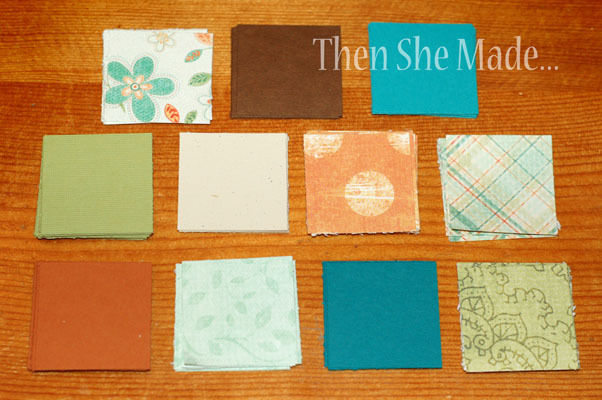 Step 4: .It's time to get out your decorative papers. When selecting papers it is wise to choose 3 to 5 patterns and some solid colors that coordinate. Also, keep your patterns fairly simple. You don't want them too busy or you won't be able to see the numbers for the dates when it is all decorated. 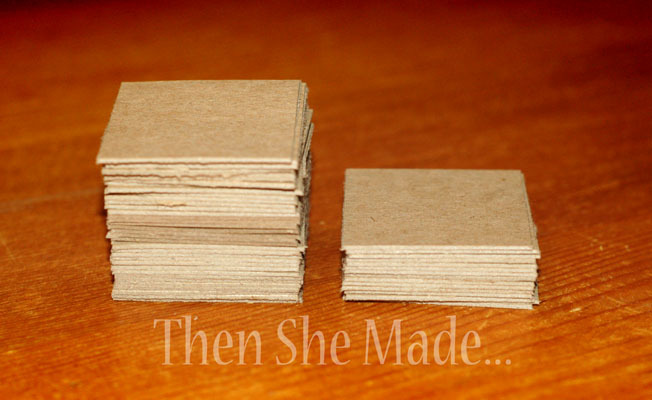 Taking your papers, cut about 5 to 10 squares of each. These squares should measure the same as the chipboard squares you cut in step 2. (1-1/2 inches x 1-1/2 inches) You will have more paper than you need but hang onto your left overs because you will use them again later. 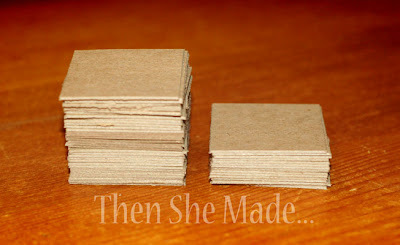 Step 5: After your papers are cut, lay out 35 of your chipboard pieces. You need 5 rows with 7 pieces in each row. 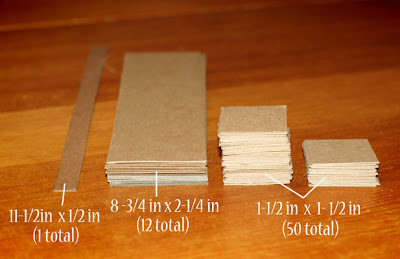 Then, start laying your paper squares on top of the chipboard pieces. For me, the best way to do this, is to start with just one pattern and put a few pieces in place (see the orange polka dot below). Make sure they are spread out well throughout the grid so that none are in the same row or column. After you get one pattern paper in place, continue with the next until you have completely filled up the grid like shown below. There really isn't a science to this, just make sure it looks good to you. 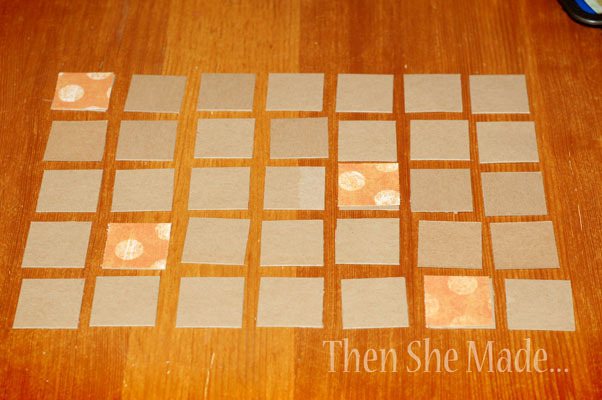 Step 6: Finally, our last step for this part, Mod Podge the paper squares to your chipboard pieces. Please note, only put the mod podge on the chipboard square to adhere to the back of the paper. DO NOT put mod podge on the top of the paper. If you do it will make it a little more difficult to decorate when we start part 2. Adhere all your grid pieces and then once that is done, repeat the process for the remaining 15 squares that will be stored for Holidays. Okay, email me if you have any questions about these steps and stay tuned for part two! I am so excited to do this project today. 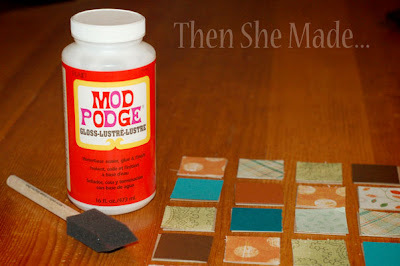 This will be my first time using Mod Podge. When I was at Michael's craft I wasn't sure if you used Gloss or Matte, so I bought one of each. I love your projects. You have so much talent! What a great idea, and so cute! You did a great job. I love it! Thanks for sharing!!! I just LOVE this! I hvae been thinking about doing something like this... but this is PERFECTLY excecuted! 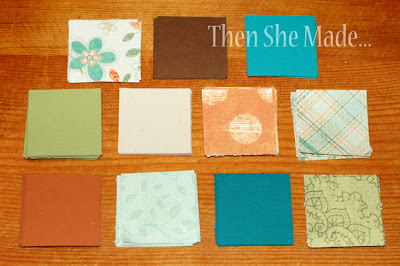 You should come link this up to my weekly Thursday through Sunday Making It With Allie Link Party! I think it would make a Fabulous addition! Just found you from the linky party - oh my goodness! I'm dying over your calendars! I've seen several different things done with cookie sheets, muffin pans, etc. But your idea on this is awesome! I'm hooked in. I'm anxiously awaiting the next steps. I do lots with mod podge and paper scraps, so this is just perfect. Thank you so much for sharing your detailed steps. My to do list just got one project bigger. Thanks for sharing. This is wonderful! Thanks for taking the time to show and share! This is on my list of things to do! Hope mine turns out as cute as yours. I have to make this. 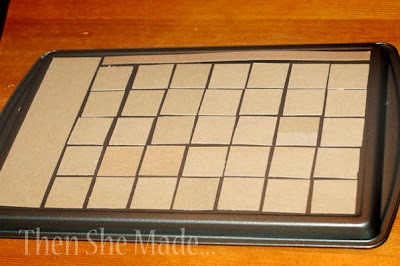 I always have tons of scraps and this will be a perfect way to use them if I dont decide to take the easy way out by spraying my chipboard with adhesive then topping with my paper and letting my cricut cut the squares. Would it be possible for you to share the vertical dimensions w us? 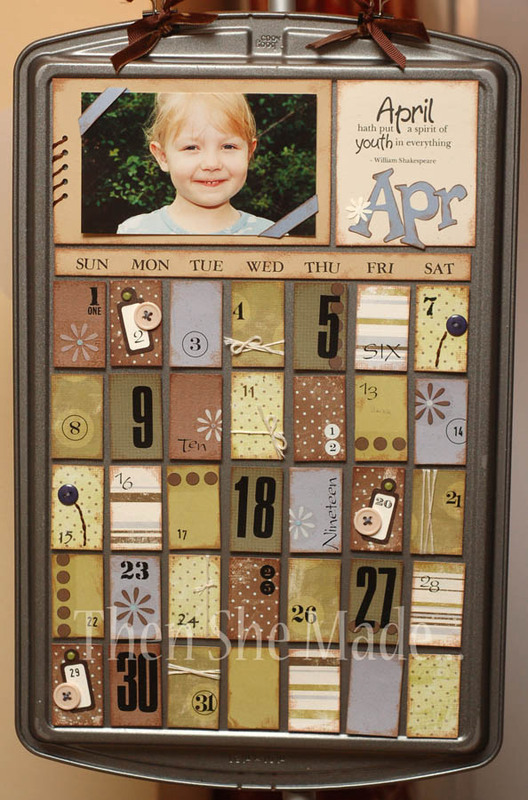 I would love to do that setup and possibly add birthday photos each month. Thanks for your outstanding ideas! "Brown Paper Hearts Hanging From String..."